This is Ryan. I need some honest answers to these thought provoking questions I'm about to share--please impart your knowledge for me and all those who have similar experiences. I'm big on social norms and get extremely uncomfortable in socially awkward situations. I can't watch a lot of the tryouts for American Idol or So You Think You Can Dance (or testimony meetings for those readers who know what I'm talking about) because people make me extremely nervous and I hate when the judges are rude to them. Now that the stage is set here is my story. I was having lunch at In and Out (be jealous); this particular In and Out is one of the drive-up only ones, but they have a little seating area outside. It's kind of like a parking lot, there are always a lot of people, but they are coming and going and you can usually get a table, it just takes awhile. While I was waiting for a table I thought to myself (I really did), "I wonder if anyone ever asks to share a table? That would be uncomfortable, what would I say if someone asked me?" As I was contemplating that thought and checking my e-mail every 14 seconds (I can't help it), a table opened up. I sat down, waited for my number and started eating. As I was eating some middle-aged guy came up and said, "Hey wanna share a table?" Really? Do I want to share a small table with a complete stranger where the conversation will be awkward or it will be even more uncomfortable if we don't talk? The answer is NO, no I don't want to have lunch with you. What was my answer? I said, "Sure". So this guy ruined my lunch because I sat there in silence constantly wondering if I should talk and praying he wouldn't--I kept taking quick bites of delicious food I couldn't enjoy just to escape the situation. I can't say no to people--ask Erica, I get caught at the door with sales people ALL the time. I almost bought a bottle of cleaner from two people from Alabama here to earn money for Disneyland or some lie. She drew some black marker on a dish cloth and asked how I would get the stain out--she went into an uncomfortable joke about "shouting it out" where she yelled at the rag, "Get out you stain!" I thought I was going to throw-up from the discomfort and colossal awkwardness of it all. They then started cleaning a window and asked if they could come inside and clean some hard water stains. Erica had to come to my rescue before I bought a $40 bottle of colored water. I have two questions really. 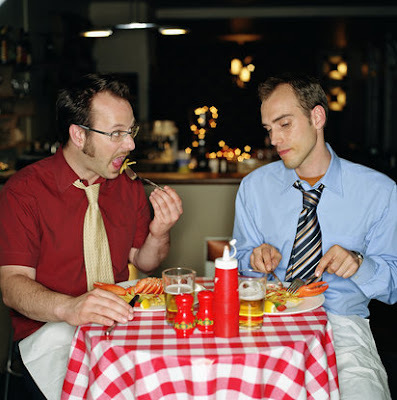 One is, would you ever ask a stranger to share a table and under which circumstances? Two, what is it about me that makes people feel comfortable enough to ask? You can ask my wife--if we are ever in a crowd and someone needs the time or their picture taken or a favor I am ALWAYS approached. I don't know what to think about this. I wish I looked more intimidating--would people approach me if I was taller, stronger, maybe had some tatoos or a piercing? Why don't they ask my wife or my friends if I'm around them. I am a social guy and even an extravert, but I am not super comfortable around people I don't know unless the situation calls for it. In fact I loathe new social situations in the beginning and can't stop thinking about what other people are thinking and what I should do to make the situation comfortable. It's a constand battle and I could use some advice. Thank you. You never cease to make me laugh! Your questions are very thought provoking. In one reguard I'm very much like you, I CAN'T say no for the life of me. I'm trying to be better at that. The reason I think you are approached so often is that you are good looking and have such a kind face. People are drawn to you because you have a very likeable way about you too. Now, about sharing a table. Is it wierd that I don't think it's wierd? You were by yourself with your own table, he's by himself with no table... As long as he wasn't trying to hit on you I think it's fine. No conversation is necessary on these occasions either. That's my opinion on the matter. PS your comments on my blog also made me laugh! I've never heard of Chinese, Japanese or whatever! Funny! I have to agree with Amy. I also believe it is your approachable and kind face that makes others comfortable. And I also agree that it is no big deal if someone asks to sit at your table; however, Amy and Erica could have someone sit down and not feel obligated to talk with their uninvited guests, whereas you and I would feel as though we needed to provide stimulating conversation and entertainment. Moral of the story: life is a lot less stressful for Erica and Amy. Now, when you figure out how to change stripes on a zebra, let me know. Always remember, the world needs both personalities to keep life enjoyable. Life is too short for judgements, critics, and hurtful comments about others. so the in-n-out in costa mesa is the same thing (drive-thru only w/ a few tables outside)- i know the EXACT situation you are talking about...in fact I think I have been the one to ask other people if I could sit at a table with them b/c there aren't that many tables! i hope i didn't make those people feel extremely awkward and ruin their lunch! well, i don't know what advice to give, but even though you may see your keen sense of social awareness as a curse, it is a strength too! You totally have the ability to make all people in a social setting feel comfortable/have a good time-- and that is a gift! Haha! I was totally laughing because I can totally relate! A few months ago I was having a nice lunch with Landon at a restaurant at the mall when someone asked to share my table. I didn't want to say yes, but I did. It was already really awkward, but then Landon made it ten times more awkward when he started projectile vomiting all over the place and I was attempting to catch it with my hands. I guess that woman will think twice before sharing a table with someone again. Haha. I just spent two and a half hours in a theatre watching harry potter with the person behind me's shoe sharing my armrest with me. He kept moving it a little further, as if staking out more and more territory. Eventually he was completely entrenched, and I couldn't confront him at that point - it was too late. I kept doing the vague half turn around, hoping he would get the hint. obviously => epic fail. Movie theater etiquette is another potentially very awkward social venue. Oh Ryan, you and your social situations. You crack me and Cody up. The best part to your story is the part about almost buying the colored water. hehehhe. I think I used to be more like you in that I could never say "no", now I have zero problem saying "no"...almost to a fault now. Ha Ha! First of all the is the funniest thing ever when the lady shouted "Get out stain"! I started laughing so hard because I could totally picture your face and trying to hold in your laugh. Anyway, I am kind of suprised you can't say no to people, because you are sort of mean. How come Erica can say no and she is the nice one? Second, I do not know why people always approach you because you scared me when I first met you and I did not like you because I think I actually was intimidated. But it only lasted half a day and then we became friends. So I know that did not help you one bit, but oh well. Just live with it I guess! p.s. NO! I would never eat with a complete stranger, maybe other things, but not share a table at lunch. i laughed really hard at nicholes comment. you are approachable. its your clean cut-ness. and im surprised you cant say no to people. that is so contradicting. so so so funny Ryan! That's why I love you. Funny and honest, at least with those of us who you know and love, right? As for asking people to take pictures...I do it all the time. I have no issues with it...in fact, I will offer to take someone else's picture if they look in need...but sometimes that is followed by - and can you take ours? As for the eating scenario...I don't think you were expected to chat. But I do think it seems efficient to share if needed. Just yesterday as we were waiting in line for rides I thought it was silly when I saw raft boats with only three people in them...why wouldn't the operator combine groups? But then he did it to us too, I was a raft with only three people in it. I felt guilty at first...and then it was really fun to just have me and my boys to enjoy the ride with. p.s. Kathy is hilarious. Cracked up at that one too! Have fun this week! The boys and I were talking about how much fun it'd be to go visit you guys! I'm jealous! If someone asked to sit at my table, I'd say SURE then completely ignore them. I would make it TOTALLY obvious I was NOT there to make a friend and I would eat my lunch/text a friend/call a friend. For some reason I feel zero obligation to total strangers which makes me maybe a really mean individual. I too can't say no and did in fact by colored water because there was no one else home to help me get out of the awkward situation. I did learn from it though and am much much better at saying no. Patrick gets asked for help all the time too. I agree that you are friendly and approachable. I think I would say sure to someone sitting at my table but it wouldn't stop it from being awkward. my fiance david is friends with your wife and the first blog i read of yours was about you wanting to lose weight. and we pretty much died laughing. so thanks for that, we welcome any and all news about your awkward situations. I think that you need to grow a goatee - they make you look SUPER tough and no one would want to mess with you. You should also swear alot more (especially when nobody else is around), say stuff like "sure you can share my table, you beeyatch"
First of all, why are you alone at lunch? Have you turned into a looser? Only kidding cuz! I agree with Cody, start cussing and maybe you won't be so approachable!! I do find it kind of hard to believe you always being nice. It must be that I'm family or something. But Lisa is right on the "Smart" thing. I also have a hard time telling people no, as does my dad. I wouldn't ask to share a table, but probably would have said yes and felt obligated to talk to them. That's a great question Mandy! Why hasn't anyone else asked why Ryan was eating by himself? Although I know he works and runs to grab a bite to eat, that still was a great comment. Mother's Day Cash-In and 9 Months Old!